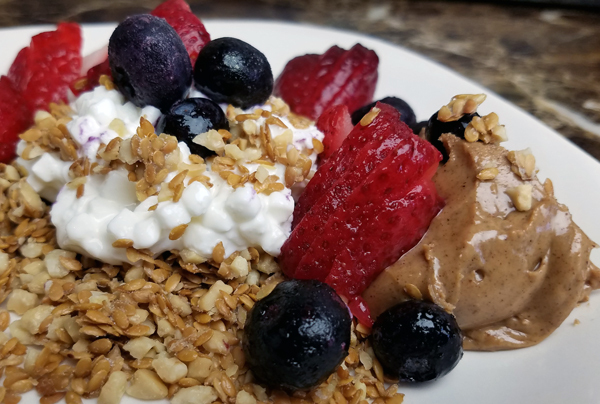 I’ll share that cake recipe with you next, but first… a quick photo tour of some of my easy low carb meals & snacks lately, to give you examples and ideas to work with. 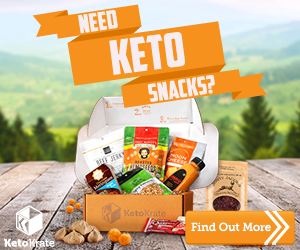 I just got a note that the May Keto Krate boxes are shipping this week, by the way. I’m back to my DAILY workouts, even if it’s just quick strength training or 15 Tricep Dips while the coffee is brewing. I got new walking shoes that are SO lightweight & comfortable for town walks with Slim, and Northside sent me a replacement pair of my favorite Northside Burke II summer hikers. Yay! Now that the weather is getting nicer, I’ve been choosing restaurants with an outdoor patio anytime I can. This meal was from a favorite little local spot – a Greek/Italian place, no less! 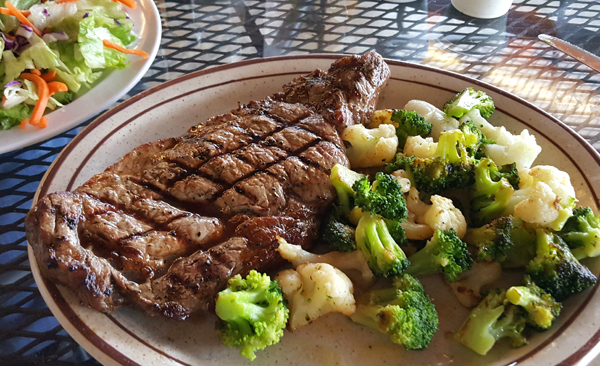 They have a beautiful 12oz Delmonico Ribeye on the menu though, with roasted broccoli & cauliflower, and fresh crisp side salads. I’m trying to remember what Aaron had that night, because he eats keto too but he doesn’t eat beef or pork. I think the same except grilled chicken instead of steak, smothered in mushrooms & swiss if I remember right. Speaking of Aaron, he did NOT like the Cashew Crunch Flax Crackers I got in two of the March Keto Boxes. I love them! Which is funny, because he has liked every other brand/flavor of Flax crackers I’ve gotten – and I have NOT, lol. 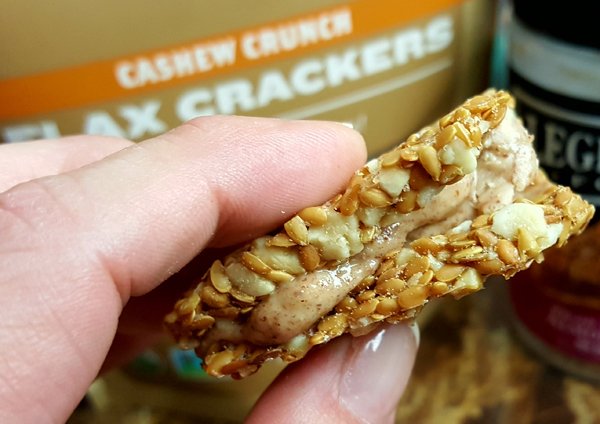 They’ve lasted me awhile because the Cashew Crunch Flax Crackers are 4 net carbs for a 28 gram serving, so I only eat them in moderation. It’s only 1 net carbs per TBSP. For the most part, Aaron and I eat very much alike and have similar taste preferences (beef, pork and Cashew Crunch Flax Crackers aside!) which makes things easy. Sometimes he’ll pick up something new for us to try, and most recently it was this Earthly Choice Coffee Flour. 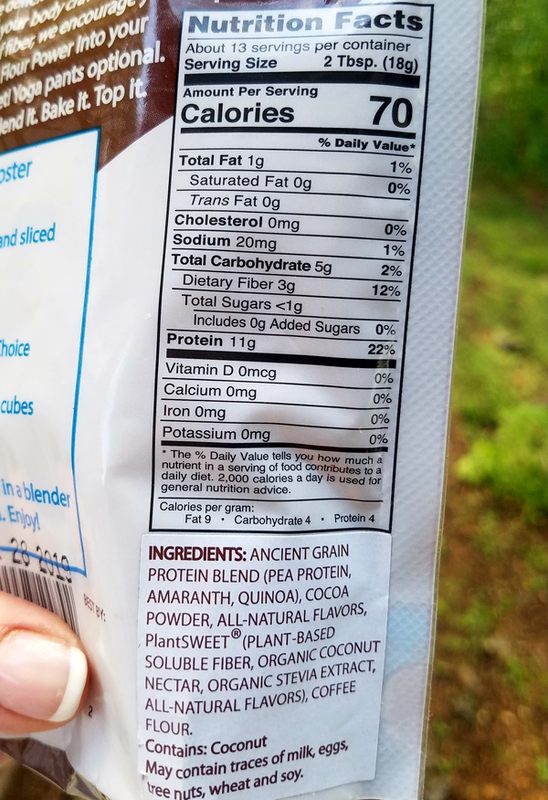 You can click on the picture to see the nutrition label. It’s 2 net carbs for a 2 TBSP serving, so a little higher than my Almond Flour which is 3 net carbs for 4 TBSP (1/4 cup), but not by much – 1 net carb difference. 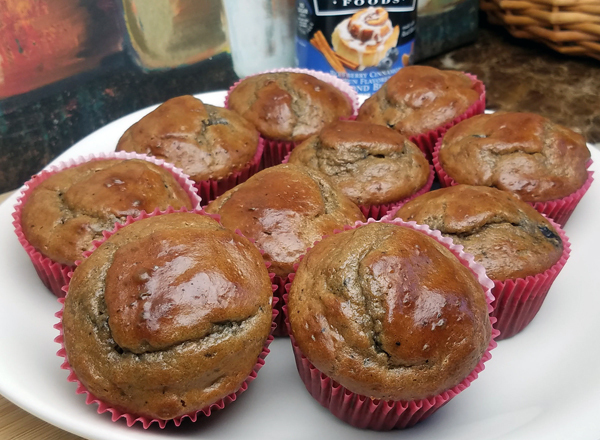 Anyway, I tested it out with one of my favorite low carb recipes for Low Carb Muffins made with nut butter. Besides turning out a little darker than usual, and having a very slight coffee flavor (which I love! ), the coffee flour worked beautiful in the recipe! 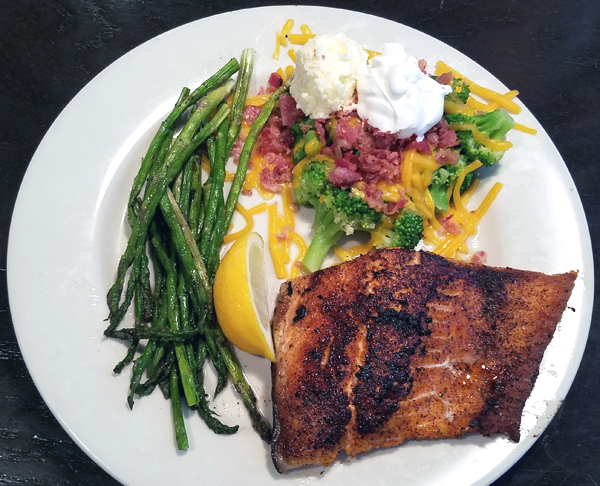 Another great keto restaurant meal Aaron and I had on a recent date was this blackened atlantic salmon at O’Charley’s – which is consistently delicious! 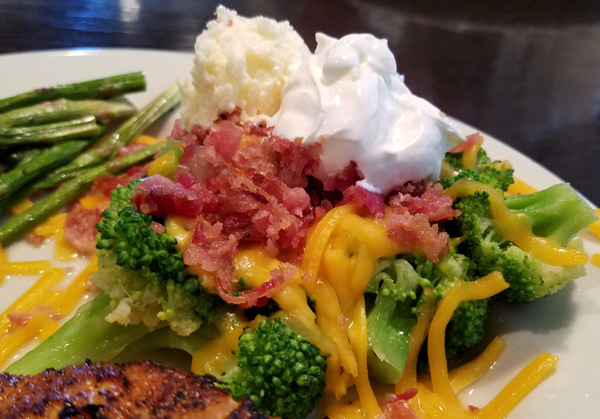 If you haven’t tried “Loaded Broccoli” yet… you should! 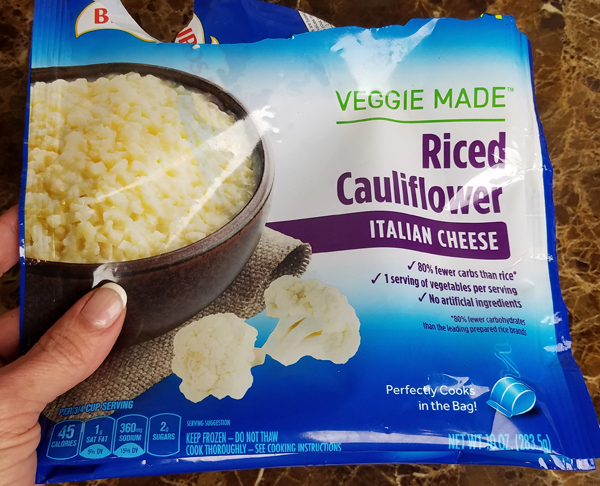 Another fun find from Aaron: Green Giant Italian Cheese Riced Cauliflower. 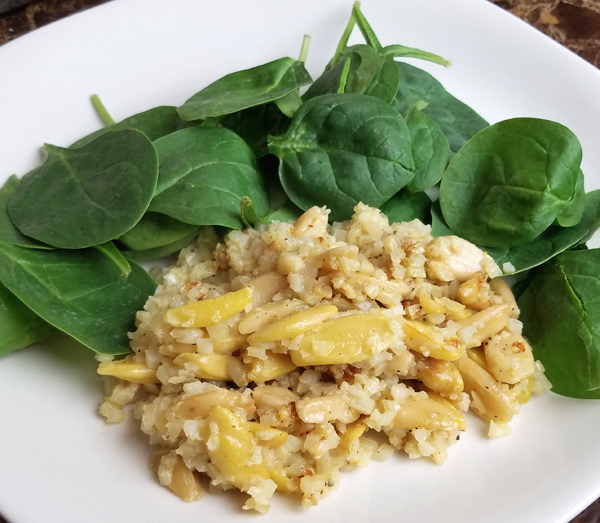 They cheesy cauliflower rice was DELICIOUS! 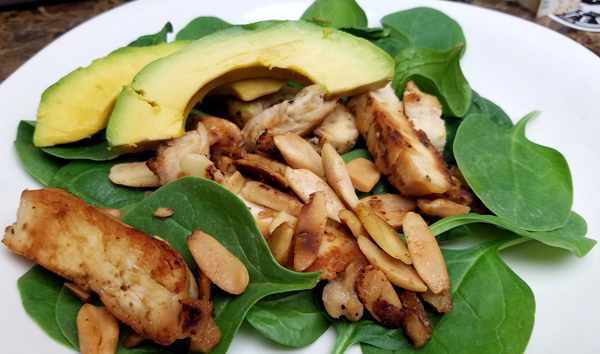 We cooked it with Pili Nuts, which added a nice buttery-soft crunch, and ate it over a bed of fresh baby spinach. 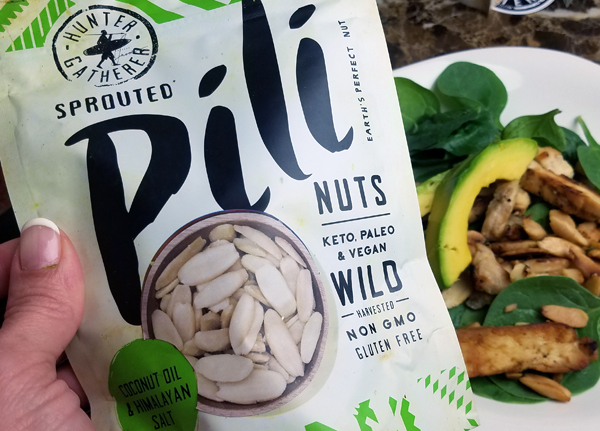 The Hunter Gatherer Pili Nuts are the only brand I eat, by the way. They were the original and first company to bring Pili Nuts to market in the United States, and they are still wild harvesting their Pili Nuts from nutrient rich volcanic soil in the Philippines. The founder of the company is super cool, and took the time to reach out to me on the phone about trying his line of Pili Nut products. When I have fresh baby spinach in the house, I tend to eat it with almost every meal. 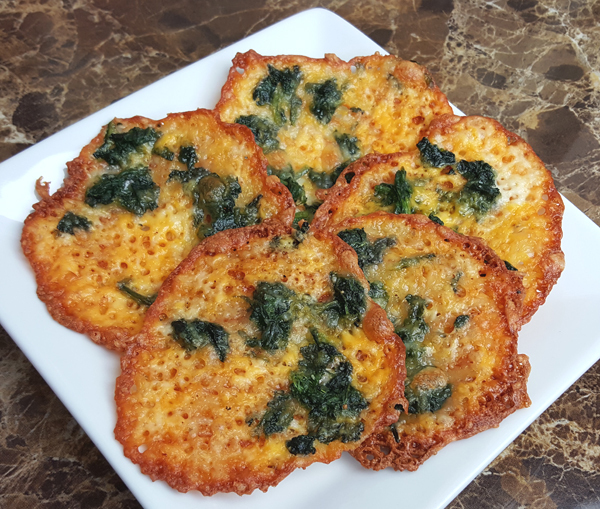 One of my favorite quick & easy keto meals is fried eggs on baby spinach – this time with a little cheese sprinkled on top. 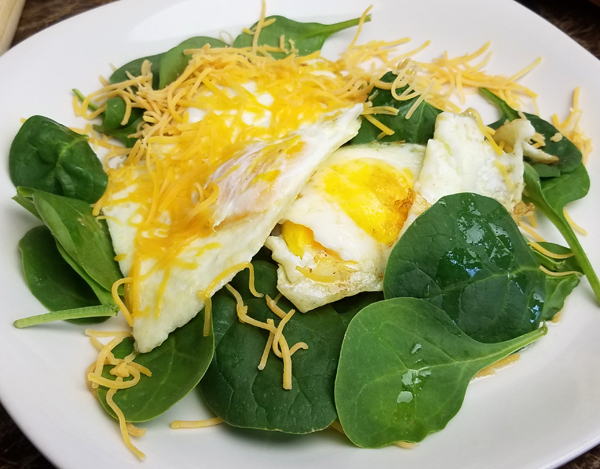 I cook the eggs over-medium in a full TBSP of real butter, then drizzle what’s left of the melted butter over my spinach – then top it with the eggs. 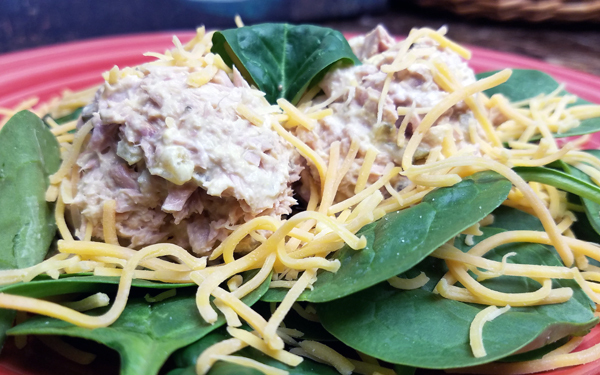 When I’m not in the mood for eggs, tuna salad is a great option too! When I’m eating alone, which is most common, I tend to keep it really simple like the fried eggs or tuna salad over spinach. 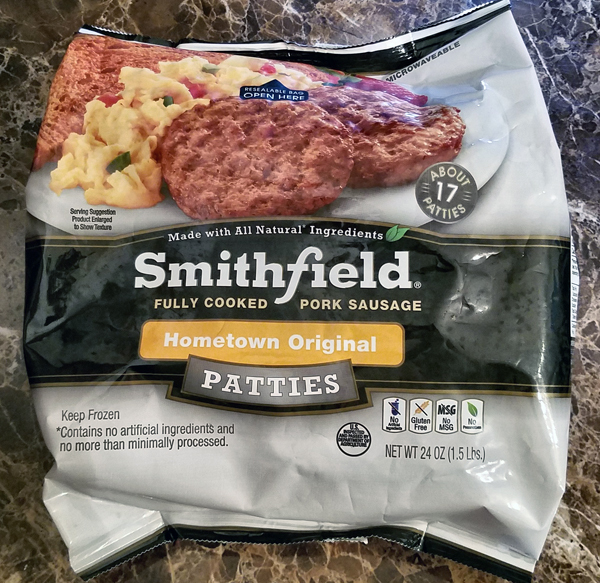 I have never been able to cook pork right – until I figured out these breakfast chops. Now I’m hooked! I just fry them on HIGH in a non stick skillet, in a full TBSP of real butter. I flip them and brown them on both sides, and they are perfectly done and tender – juicy with crispy fat. Yum!!! 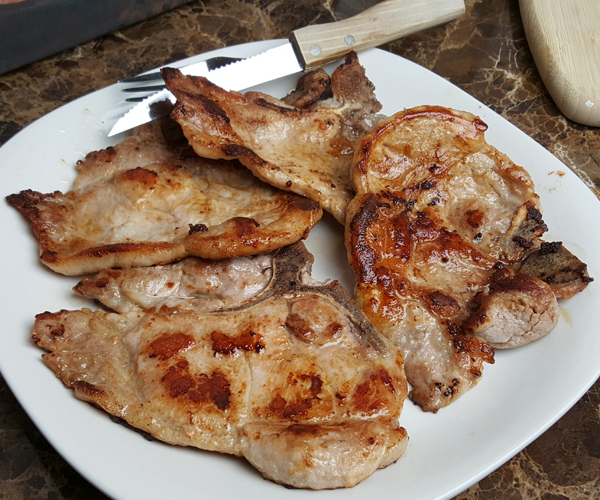 I usually get them in a pack of four chops, about 4 ounces per chop, and I can eat two at a time usually – sometimes three. I’ve also been enjoying that big bag of zero carb frozen sausage I found recently. I heat it in the microwave by the directions, then pan fry it on each side for a minute or so too. These are days Aaron and I are NOT cooking together, obviously -lol. 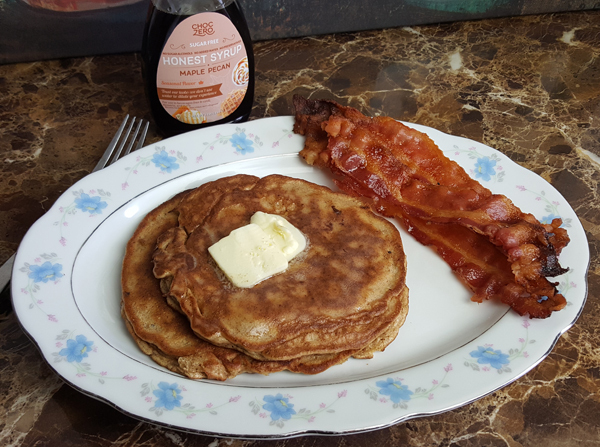 These are Apple Pie Pancakes using my Nut Butter Recipe. Delicious! Speaking of leftovers, I had some leftover steamed spinach. 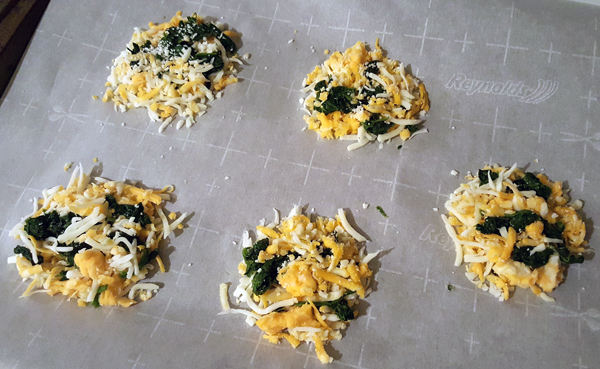 I decided to make cheese chips one night to enjoy while watching a movie – and added the leftover spinach to them. 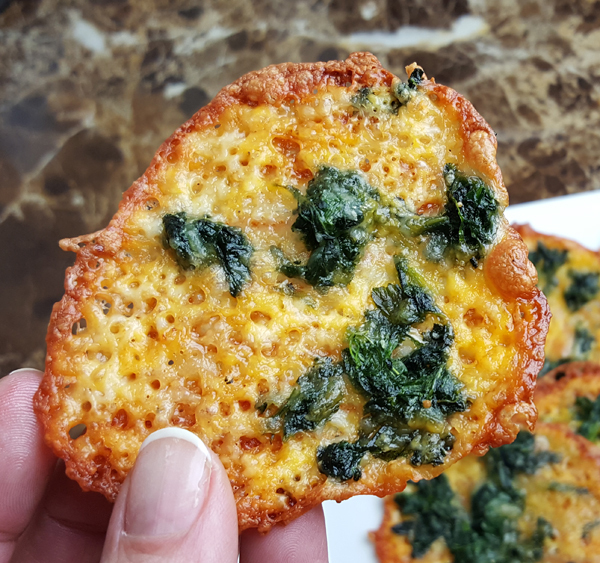 You have to squeeze all the water out of the spinach of course, then just add it to your little piles of shredded cheese – and bake it on parchment paper at 400 degrees until crispy. 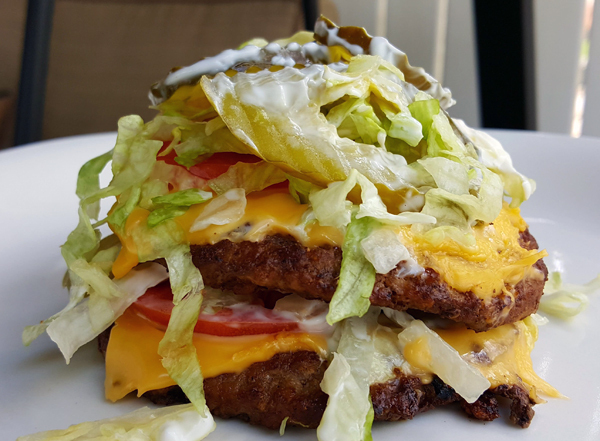 I haven’t had much low carb fast food lately, but I did have birthday coupons saved up for free Sonic Drive-In cheeseburgers – so I picked up two of those one day. 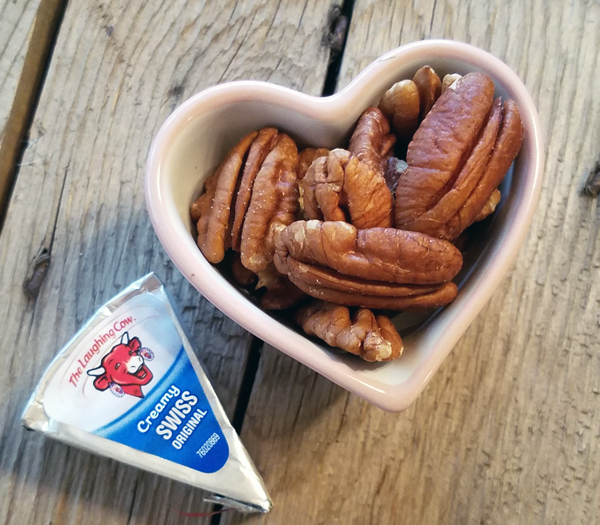 Pecans are a favorite because they are very high fat and low carb, and I love the Laughing Cow creamy swiss wedges to dip them in. 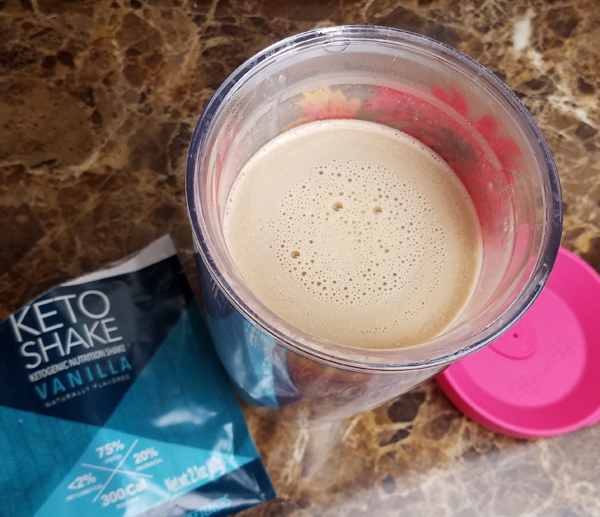 On the topic of long work days, I’ve been enjoying a BPC-style hot coffee keto shake to get me through long afternoon stretches. I use Ketologie shake mix. 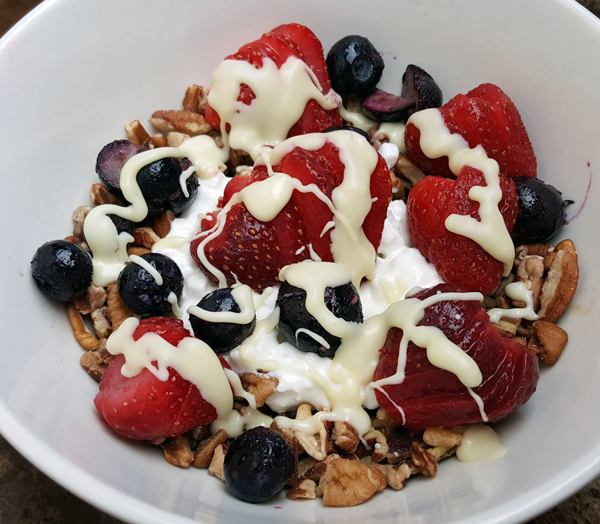 You can read all about Ketologie here. They have GREAT products. We have a coupon code now too! 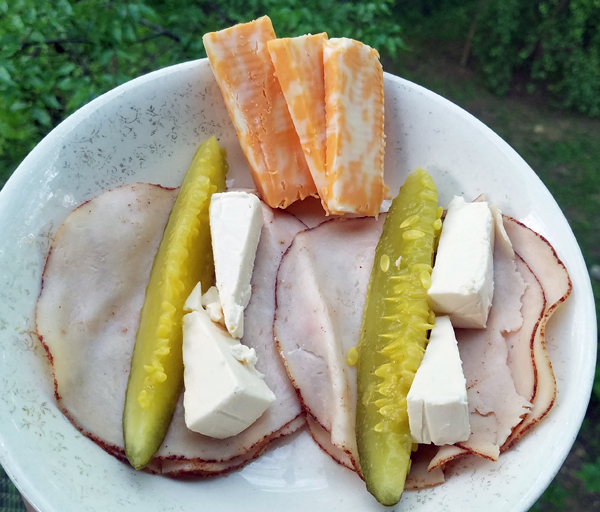 Use: TravelingLC for a discount on any Ketologie orders $30+. 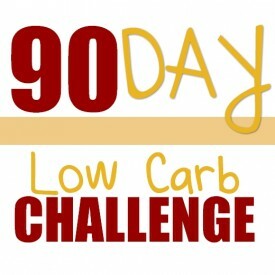 I eat my favorite “low carb cereal” almost daily, of course. 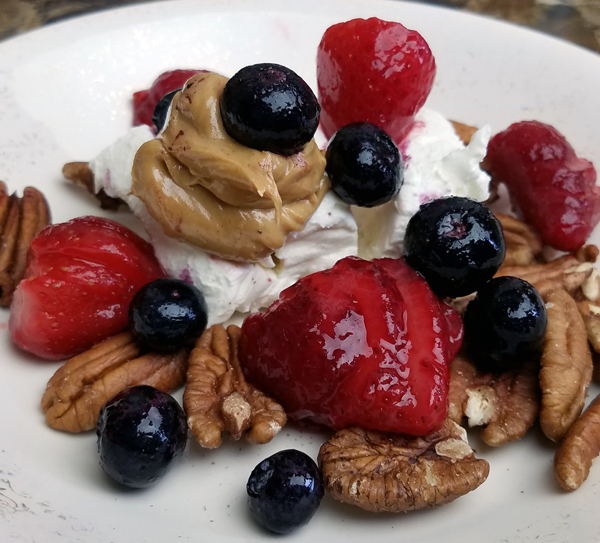 It’s usually: 1/2 cup pecan pieces, 1/4 cup Daisy brand 4% cottage cheese, 4 small strawberries and 18 grams of blueberries. 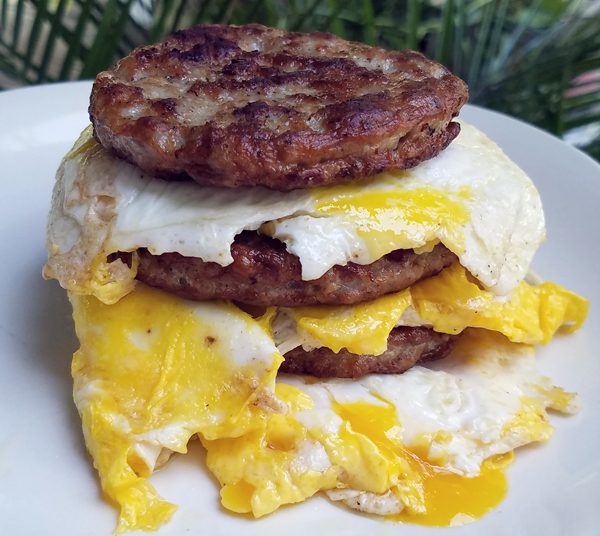 That comes to 5 net carbs and 85% healthy fat – perfect LCHF macros! 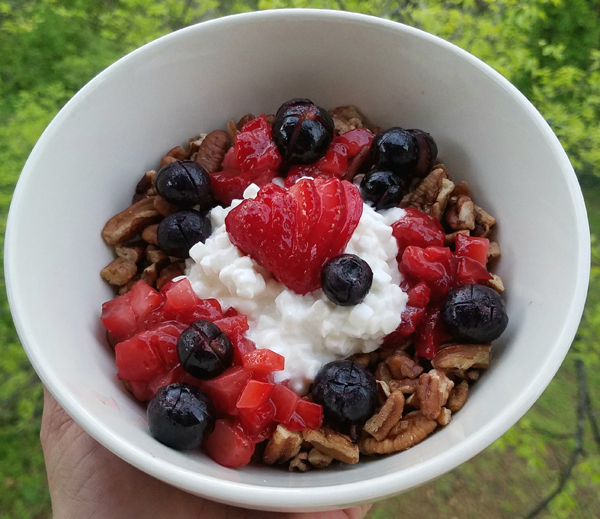 I keep strawberries and blueberries in the freezer year-round, and usually have some variation of my usual low carb staples: pecans, berries, cream cheese, etc. 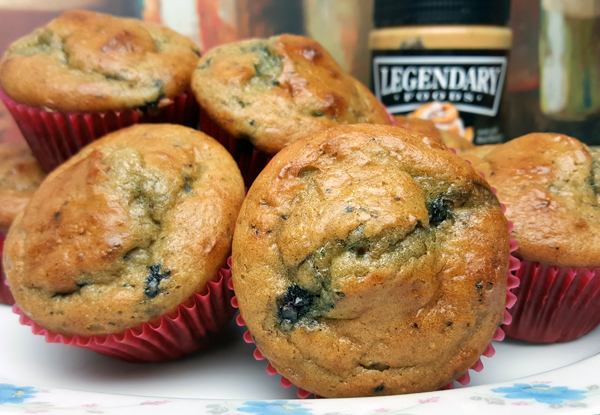 Cream cheese, peanut butter or almond butter, strawberries & blueberries. 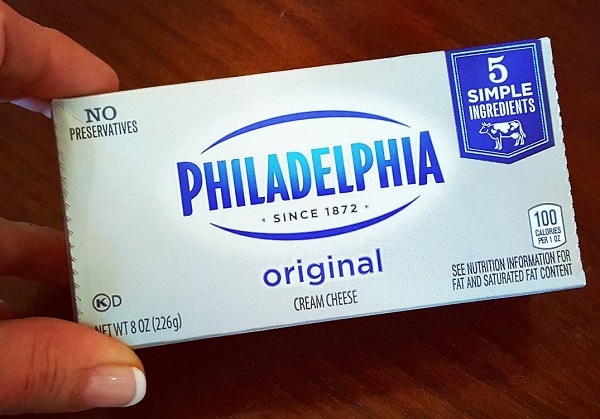 The cream cheese I use is Philadelphia 5 Simple Ingredients, which is half a carb per ounce instead of 2 carbs per ounce like most cream cheese. 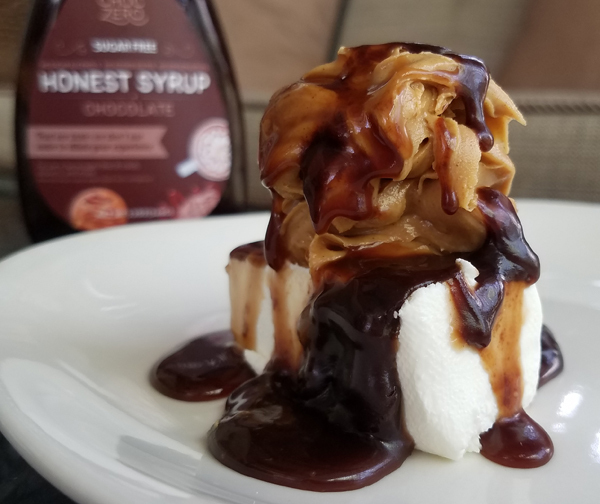 Another favorite cream cheese plate, when I’m in the mood for something sweet: cream cheese, peanut butter or almond butter, topped with sugar free chocolate syrup. 🙂 YUM! 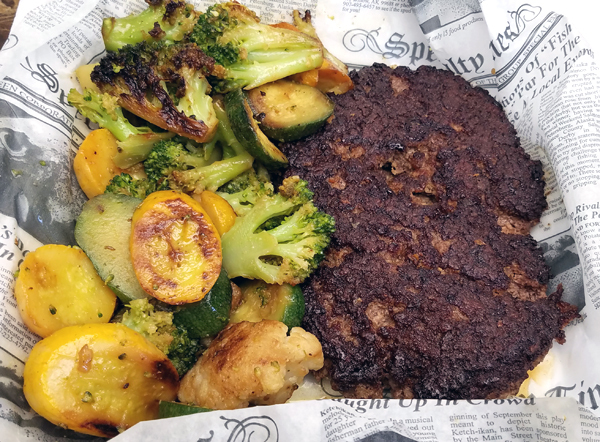 It’s a half pound char-grilled hamburger steak with roasted mixed vegetables. Especially if they’re spinach burgers! 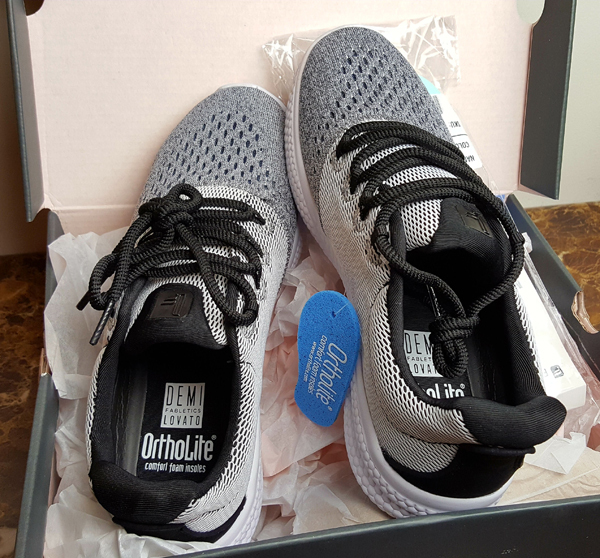 These are the new super comfortable, lightweight walking shoes I got for our fast-paced town walks. I picked these because they go great with leggings too, just being honest. 🙂 But they had GREAT comfort reviews. I got them on sale at Fabletics and I think they sold out. I made a quick dash to the store earlier and stocked up on staples: eggs, pecans, cream cheese, water, tuna, frozen berries, coffee and bacon. Today I mostly ate that chocolate protein cake I baked last night. 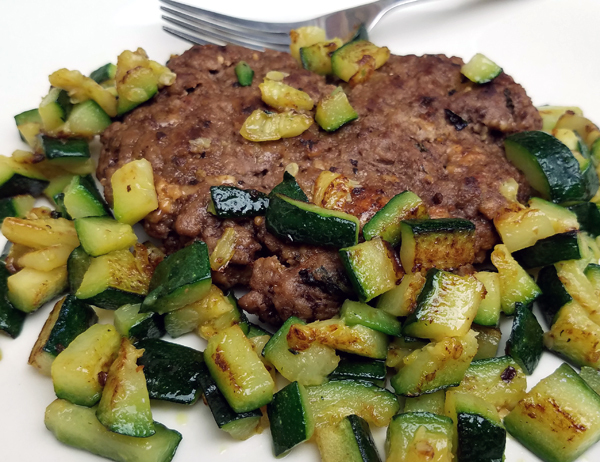 ← Crispy Macadamia Crusted Zucchini Fries – Keto Recipe Fail & Creative Save! 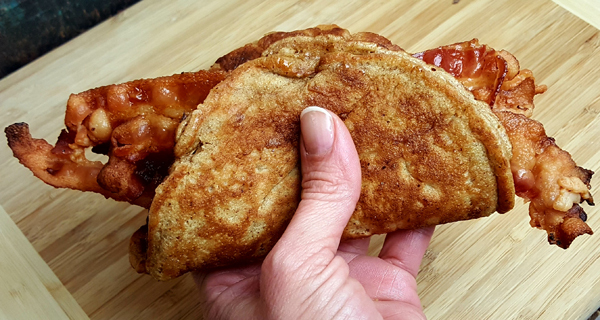 Lynn, great food ideas in this post! Our closest O’Charlie’s is an hour away, but I definitely want to try that salmon ASAP. I’m curious about the arch support in the Burke sandals. There were mixed reviews on Amazon regarding that. Can you give me some idea please? I need good arch support. Thanks for keeping us informed and inspired! I’m not sure about the arch support in the Northside shoes. It seems good to me. I have walked and hiked in them A LOT (a 10 mile hike over rough terrain even) and my arches have never bothered me. Definitely read the the reviews! The Keen brand are 3x the price, but you might compare the reviews to their version: KEEN Women’s Newport H2 Sandal . I’ve been thinking to get a pair of those and compare them to my Northsides, or the Keen Whisper style, but I think the H2 are more suited to my rugged use, lol. So many styles to choose from it makes my head spin! lol – I have 3 colors/styles picked out from both companies so I need to sit down and just make a decision already! I wish I could sure pictures, but this week I’ve had the taste for seafood. Specifically ahi tuna steaks. I brought a beautiful 8oz tuna that I ate medium rare over cauliflower rice topped with soy sauce, sesame seed oil and green onion. I was hooked. So during the week i decided to try poke (raw fish salad). 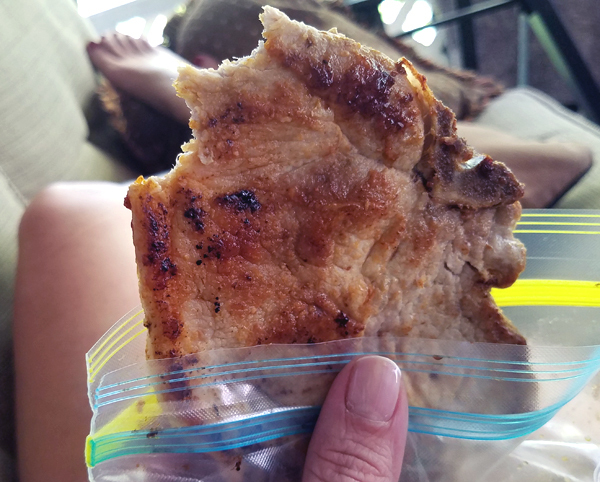 I brought frozen wild caught tuna steaks that was recommended as safe to eat by another keto blog. I know sushi grade is best but I was trying to do it on the cheap. As I was cutting I I found a worm. Plus, the smell was slight fishy which was off putting. That put an END to my craving for fish. I just wish I had something light and freshing to take to work other then a green salad. What about some lettuce wraps with thinly sliced meat and some cheese with avocado & a dressing or mayo? That would make an easy light lunch to take! 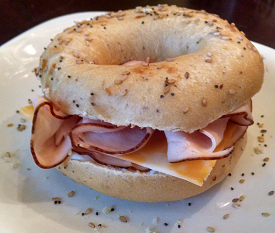 Those are convenient, or slices of meats you cook for dinners – leftovers will make great lunches! I noticed good dee has pancake mix. Have you tried it? Also, I’m going to be ordering from good dee’s And or netrition soon. Do you have codes for those or links I should follow? I want to make sure they know I’m coming from your webpage. Thank you! Good Dee’s mixes are great, aren’t they?! 🙂 Do you make your brownies with the peanut butter & walnuts too – and have you tried her blondies yet?? I love her pancake mix. It’s really good. 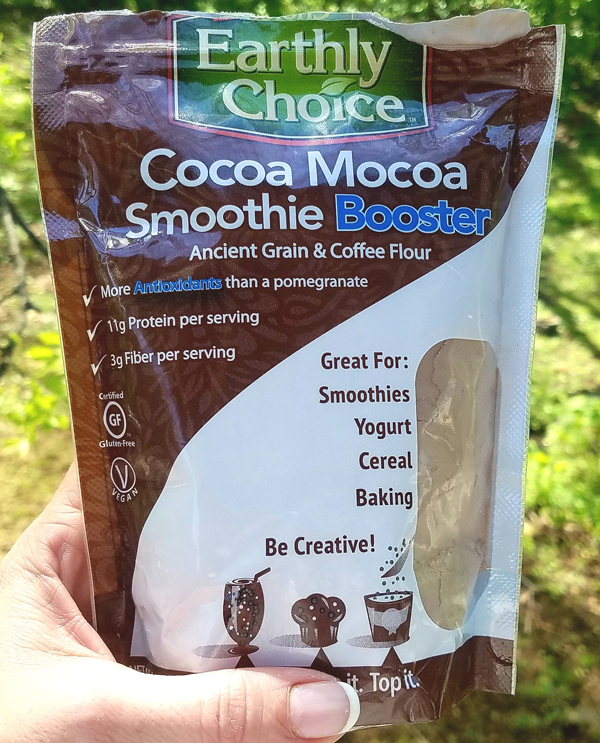 I would definitely eat it if I had it, but it’s more expensive than the one I normally get from Netrition at the link above (which also lasts me longer too) – and they are both equally as good so I stick with New Hope Mills. Thank you! I will definitely use your links when ordering. I want to make sure they know where I heard about the products from. 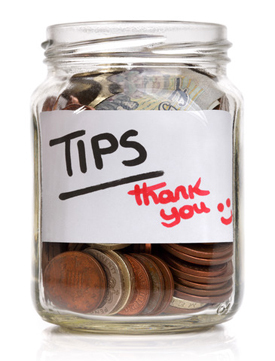 Thank you for your site and replies. I know it takes so much time to post and reply to every comment and leave such detailed responses takes even more time. I really appreciate all you do. Oh and I just made the blondies last night. I made them just as the pancake said this time but next time will use your receipe to jazz them up. 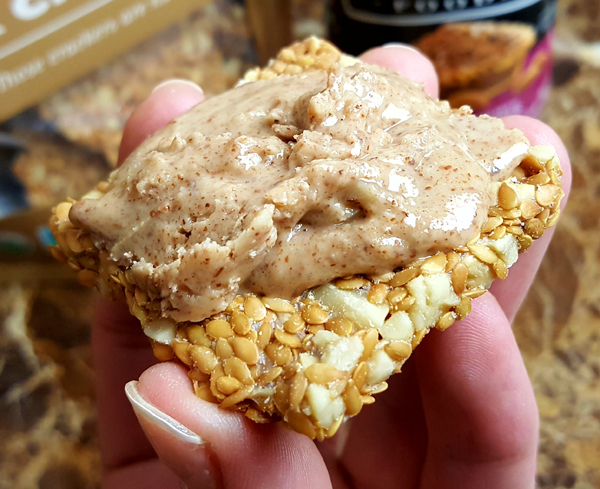 I topped with some smuckers natural peanut butter and had one with coffee. So delicious. Just found you on Pinterest. You’re my new guru! ❤️❤️❤️ Who knew I could make DESSERT in two minutes with only 3 ingredients??? lol Nanci – welcome to the fun! 🙂 I’m so glad you joined us here. I look forward to getting to know you!